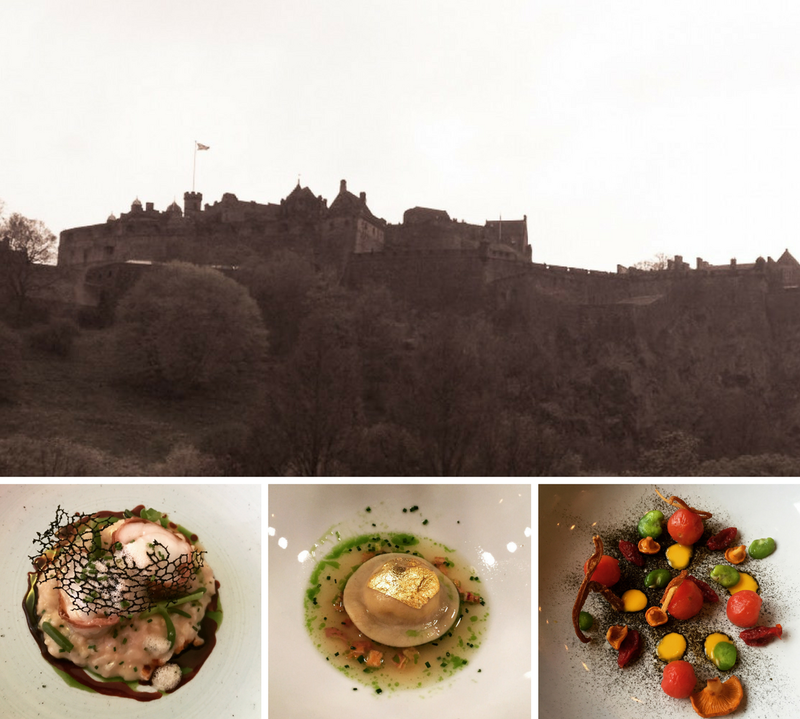 Yet another Itison voucher (well actually two) brought Edinburgh Feasts to Harry’s Bar. On arrival they didn’t seem to have our booking, but this was no bother and they accommodated us. You can find Harry’s in a spacious basement, offering fab drinks and tapas. We greedily had a voucher each but we had chosen slightly different options. Each voucher offered four tapas dishes but mine came with a cocktail and my friend’s voucher came with a glass of prosecco (at a slightly cheaper price). Without the voucher, you can get 3 tapas for £14. I ordered the chorizo mac and cheese – which my friend highly recommended, moules frites, courgette tempura and calamari rings. My friend picked the mac and cheese, tempura fish bites, chilli and garlic king prawns and potato cubes, chorizo and cider sauce. I ordered the rhubarb and elderflower gin cocktail but sadly they were out of the gin. However, they did offer to make an alternative with ordinary gin and rhubarb bitters which tasted lovely. The feast spread out before us and I really didn’t know where to start. I put my sensible hat on and started with the calamari as that was likely to turn quickly. They looked a little anaemic but actually tasted fine. They were generously sliced rings and the dip was delicious. The courgette tempura was great and also had a similar accompanying dip. I could pretend I was being a little bit healthy whilst also managing to enjoy the light tempura too. The moules frites were probably enough to be a lunch on its own. I ended up passing the fries to my friend and focussed on the mussels, which were of good quality and sat in a light, creamy sauce. Lastly, but by no means least, was the chorizo mac and cheese. My dining companion was not wrong on how good this tasted. You even get a couple of bits of garlic bread alongside to dunk in it. If I bought this voucher again, I would seriously consider just ordering four of these. The cheese was oozy and the pasta luscious. The chorizo added a lovely twist. Across the table from me, mac and cheese aside which was already a given, the dishes were also going down a treat. The potato, chorizo and cider was a particular favourite. The prawns were big and juicy but the fish bites were probably the most uninspiring of the lot. The staff were great in Harry’s Bar, with what I assume was the manager giving us some light hearted chat which made us feel very welcome. Cost £18 for voucher with 4 tapas and a cocktail and £14 for voucher with 4 tapas and a prosecco. After being wowed by Ishka’s Instagram account, we had originally intended to attend one of Ishka’s launch events. We could only attend the first or two dates available, which upon arrival was clear was not happening as the place was still a building site. With no explanation from the PR company, we left it a little while to let the place get going. We were off to see a show at the EICC and as this was handily across the road, we decided to take the opportunity to finally try it out. Ishka is a smallish venue but has an array of tables and booths. We were given a booth which was nice. There was a giant pillar candle on the table which had left quite a bit of wax splattered across the surface but at least that was off to one side. We were given both the a la carte and market menus. The latter seemed reasonable at £14 for two courses and £18 for three courses. The price on the menu was a little more expensive than on the website but at bill time we were charged the lower fee (as quoted above). The drinks were a little more on the expensive side but the cocktails we had were all excellent. We all ordered from the market menu. I went for the cauliflower veloute followed by the bavette steak. My friends chose the veloute or the smoked chicken for starters. For their mains they also chose the steak or the pork loin with glazed pork cheek. I was a bit surprised at the size of the veloute upon arrival. This was a massive soup bowl, far bigger than a usual starter portion. The veloute also had some big chunks of coated black pudding and some curried potato chips. The two of us that had this dish thought the black pudding was going to be sprinkled across the top so found it a bit heavy in the way it was served. The veloute was sorely underseasoned and wasn’t remedied by the black pudding. All in all a bit disappointing. The other two were eating the smoked chicken, which was received more positively. Overall the dish was good and the chicken cooked well. However one of them commented that the accompanying saffron yoghurt was a little overpowering for the rest of the dish. We hoped for more with the mains. Three of us had the bavette steak, presented on beautiful red plates. The steaks were all cooked to our requests, which was pleasing. The cut isn’t that easy to eat though, which was a bit of a shame. The steaks came with fries and salad, which had a generous seasoning of salt. We thought this dish was ok but not as good as it could be. The final one of the group had the pork. Sadly she thought this was poor, with some of the meat being incredibly dry and the whole dish needing to be exposed to some seasoning. She was very disappointed. Only two of us decided to venture onto desserts. One went for the passion fruit tart and the other the apple meringue. The tart was shallow and wide, and served with a coconut ice cream. The apple dish consisted of apple compote, toffee and pistachio cake. These were both enjoyed. The flavours and textures of both dishes were of good quality. Whilst the décor was slick, those sat on the outer facing side of the booth felt incredibly close to the nearby tables and people being shown to their table were often brushing perilously close to our food and drinks. It was also difficult for the waiter to serve those on the inner side of the booth, having to lean over the wall from the bar side to place and collect dishes/glasses. Ishka sadly failed to meet expectations. We desperately wanted the place to do well and the service was very good. Sadly, overall the food didn’t quite make its mark. Worth a pop in for a cocktail if you are feeling flush. Cost £107 for two 2 courses for the set menu plus two 3 courses from the set menu, 1 bottle of wine and two cocktails. We booked here for a team Christmas lunch/away afternoon for team building purposes. A couple of us had been meaning to try The Magnum for ages, so were looking forward to visiting. The Magnum is a nice venue and seemed bigger on the inside than it appeared on outside and is serenely decorated. We were all struggling to pick what to have from the menu as much of it sounded yummy. In the end as we had all eyed up the baked Camembert to share, we got two of those between the four of us. Then I went for the sausage of the day, which was lamb and thyme, another colleague went for tempura battered haddock and the other two went for the beef and rosemary burger. One of my colleagues had dithered on whether to get the burger as she was worried it would be big so asked the waitress for advice. She tried to describe it as best as possible to help her make a decision, which I thought was good service. The Camembert arrived and was impressive. The cheese was studded with garlic and rosemary and none of us could wait to get our gnashers in. The accompanying ciabatta was plentiful so there was no real worry about running out. It would have been nice to have a bit more of the onion confit, particularly as we were sharing, but the whole lot was delicious. I am drooling just writing about it now. I would come back here for this course alone. The mains came out in good time. My lamb and thyme sausages were delicious. They were cut in half lengthways which was a little odd but I didn’t really mind. The green beans still had some crunch and being wrapped in prosciutto was a nice touch. The mash was super buttery which was lovely and possibly some of the best I’ve had and the gravy brought it all together. The fish actually was two pieces, which was incredibly generous, but perhaps a little too much for lunch. The batter was light and the hand cut chips were crispy how she liked them. The broccoli and chilli salad was lacking a bit more chilli but was still good. The accompanying sweet lemon and gherkin aioli was really good but my colleague thought some extra pickles in it would make it sharper. The burger was bigger than described but was claimed by one colleague as possibly the best burger she has ever eaten.. The other colleague didn’t rave quite so much about it though, so it’s a preference thing I think. The relish was good and the meat juicy. The focaccia bun worked well but was filling. We were all stuffed so abandoned idea of dessert but weren’t hurried out whilst some of the team finished their drinks and we did some team building chat. We had a good experience here and apart from a few minor niggles (the sauces that were offered at ordering didn’t appear until re-prompted and my colleague who ordered a Coke got a Diet Coke – but was offered a change) service was very good. We all left saying we’d be back again. Cost £98 for four starters, mains, a bottle of prosecco and two soft drinks. Copper Blossom is a stunningly beautiful bar. Some stuck in a stereotypical mind-set may call it ‘girly’ but regardless, it is right up my street. Adorned with pretty lighting outside, we welcomed into a gorgeous place full of warmth, hidden from the gazes of pedestrians on the street above. We were shown to our table. We had pre booked and had kindly been given a table for four for the two of us, which was a nice bonus, considering there were a fair few other patrons that evening. Once seated, we were informed that one starter and one main were not available, which was a bit disappointing as not only was the main the one I would have chosen but there are only a small number of dishes in the first place so that left little choice, as there wasn’t a substitute offered for the missing dishes. Also we had arrived at 6pm so it is unlikely they should have run out. Anyway, ignoring that niggle, I went for chicken liver parfait followed by Parisian gnocchi. My dining partner for the evening went with cider braised pigs cheeks followed by chicken caesar salad. We also could not miss the opportunity to try a cocktail each. I opted for the Lady in Pink, which was a vodka, Chambord, apple juice combo and my friend went for a White Lady, which was gin, Cointreau, lemon and sugar. These arrived in a timely fashion, which is often rare for cocktails. Mine was nice. My friend pulled a face but that was just because hers was a bit sour but she actually liked it. The first course came out. My parfait looked a little underwhelming and toasted brioche was burnt at edges. However, the dish as a whole tasted quite good and the side salad with pomegranate was a fun addition. On the other side of the table, the pigs cheeks were ok but bland and under seasoned. It was also not quite what she expected. It was a little bit of a disappointment. The mains came as quickly as the starter plates were taken away. My main, gnocchi, was surprisingly luscious. I often don’t opt for a veggie choice but I didn’t miss the meat here one bit. The bed of pureed butternut squash, crispy shallot rings, kale and salsify worked in harmony with the gnocchi for a decent dish. My dining partner found the chicken salad light but generous on chicken portions, resulting in an enjoyable dish. We’d opted for an additional side of chips. These string fries were really good. However, I found the bloody mary ketchup a little harsh. For dessert we both had sticky toffee pudding. It was nice, light but too big. My friend thought it was not really a proper sticky toffee pudding as it was ‘not toffee enough’. Ah well, I enjoyed it! Copper Blossom is a great. The food is decent but I feel that it is still trying to find its feet, not knowing quite where to pitch itself. I would love an evening burger option (which was only available in the day) or just to have a fuller menu. I’d quite happily pop in again though. Cost – just over £60 for two cocktails and two three course meals.